Redstor provides managed services with industry-leading service level agreements to a wide range of clients across most industries. Redstor’s expert support is available to assist clients while the service is being set up, during normal service operation, and in the event of restore requests or DR invocation. When you want support, you’ll be speaking to the technology vendor and infrastructure owner. Redstor feeds your input directly into software development. That’s why Redstor's software is constantly improving in the way clients desire. You can rely on Redstor's local, SA-based support team, who can visit your site when required. There are no frustrating time-zone differences and no data sovereignty concerns due to data crossing borders. Redstor is devoted to service excellence and is empowering staff to deliver it. Redstor releases monthly software updates with new features and patches. 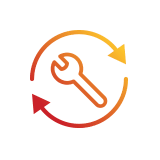 The software regularly auto-updates and Redstor works hard to ensure your IT team is always aware of the latest changes and new functionality. Redstor has recorded 99.999% platform availability throughout every month of 2014, 2015, 2016 & 2017. The service features unparalleled levels of resiliency and redundancy in both SA data centres.